The Amish are a separate sect of the Mennonite church, which is a Christian fellowship that was first formed in 1693. There are several different subgroups within the Amish people and each community in those subgroups make their own decisions about how to live life, guided by a set of rules known as the Ordung that is largely unwritten. According to Amish scholars such as Stephen Scott, most Amish people do their own farming to cultivate food and crops for their families and communities and there is some uniformity about what tools they use. The Amish belief that each person and family should be self-sufficient, sustainable and thoughtful about the technology they adopt has contributed to the non-Amish stereotype that they blindly reject all technology. Amish use significantly less modern technology than other people, and their use of technology is governed by community and individual decisions about the effect using the technology will have on their lives. For example, they usually reject automobiles because they believe being so mobile detracts from a sense of close community. These considerations have governed how Amish groups have chosen to tend to their farms, where they often grow corn, tobacco, grains and alfalfa. Generally, the Amish can choose to adopt to a technology or adapt it to a use they find ethical. There is also an entire industry devoted to farm tools and machines that were created, built and manufactured by the Amish for Amish use. 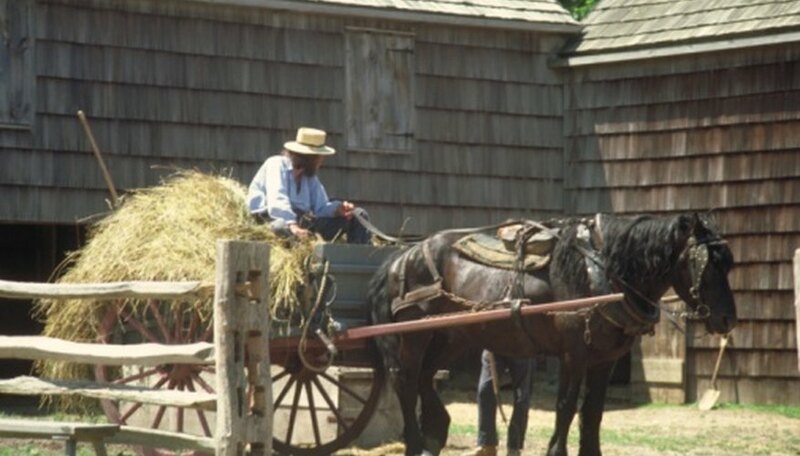 The Amish can use horse-drawn plows with a farmer's seat to break up hard compost. These plows are very much like the two-wheel plows popular everywhere in the 1860s. Tractors have been embraced, shunned and approved then revoked by certain sects of the Amish for farming. Some see them as extensions of steam engines, while others approve them for specific tasks only, such as threshing wheat. Others believe with its self-propulsion the tractor is still too similar to an automobile. Still others approve tractor use in the barn but not in the fields where the pure work is done. The Amish employ cultivators to loosen soil and remove weeds before they plant their seeds. These can be smaller, hand-held cultivators for hands-on use or larger versions drawn by horses or mules. Other tools frequently used by the Amish include hay loaders, corn planters, discs, drags, grain binders, grain drills, grain and hay elevators, harnesses, harrows, hay balers, hay tedder, hay wagons, rakes, sickle bar hay mower, threshing machines, silage choppers, manure or fertilizer spreaders and tobacco planters. Corn reaper-binders cut the crop and tie the stems into small bundles. Feed grinders are hammer mills but with steel wheels on a stationary tractor. Field sprayers are pesticide sprayers powered by gas engines. The forecart is a more recent invention by the Geauga community, a cart hooked behind horses with a driver's seat and a drawbar for other farm implements.